Product #31150 | SKU MVI-LTG | 0.0 (no ratings yet) Thanks for your rating! 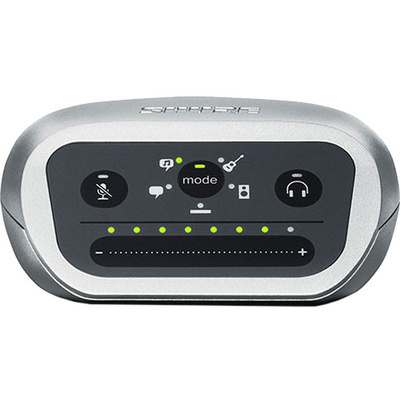 The MVi from Shure is a single-channel, simple-to-use, digital interface for connecting microphones and instruments to Mac and Windows computers, as well as the range of iOS and Android devices. Simple and flexible, the unit features an XLR + 1/4" TS combo input jack for microphones and instruments, five DSP presets, and a touch panel that allows real-time access to volume, gain and mode selection functions. Phantom power for condenser microphones, appropriate cabling, and a rugged all-metal construction make for reliable digital recording wherever needed.